They say “celebrity deaths” come in 3’s, but over the last few decades, years, and months, we’ve made so many people famous that it’s hard to tell when the last 3 ended and the next 3 started. Fame used to only come to those who earned it through artistry or accomplishment, but now it’s handed it out to anyone pretty or scandalous enough to move the reality TV ratings (which just leads to more “celebrity deaths”). But that’s another essay. This is about the recent deaths of two true artists, Adam “MCA” Yauch of the Beastie Boys, and Maurice Sendak, writer and illustrator of the legendary children’s book Where the Wild Things Are. On the surface, it would seem the only thing these two might have in common is dying a few days apart. When Sendak first published Where The Wild Things Are in 1963, critics and concerned parents thought it was too deep, dark, and angry for children. It received negative reviews and was banned by libraries. The following year, Adam Yauch was born. That might be where the obvious similarities end, but upon closer examination, a case could be made that the Beastie Boys and Where the Wild Things Are unlocked the same thing in all of us. They both looked a bit scary on the surface, both alarmed some parents and critics, and most importantly both taught us that we could go up to our rooms and disappear into our own imaginations and create a whole new world. They both forced everyone to reconsider what was appropriate entertainment for our youth. A lot has been written this week about Yauch and the Beastie Boys influence on hip-hop and pop culture in general, and most of it mentions the racial component in passing (or gets all post-racial by never mentioning it). While we might be much “color blind” and accepting in 2012, I put color blind in quotes because the fact is we can all see the Beasties are white. And the fact that these white kids making this crazy rap raucous were also Jewish? Silly as it might seem, that mattered to Jewish kids like me who were gravitating toward hip-hop. 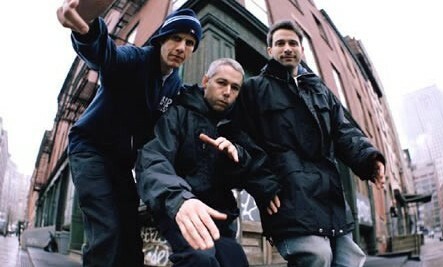 The Beastie Boys showed us that if we were good enough, we could make any type of music we wanted. Wild Things: Michael Diamond, Adam Yauch, and Adam Horowitz (left to right). For those of us in bands on college campuses in the 90s, you wouldn’t even take a band photo with a fish-eye lens for fear of looking like you were biting the Beastie Boys. Instead you’d spend all your afternoons jamming every style of music you could fake your way through, dreaming about samples and someday making records like Paul’s Boutique, Check Your Head, and Ill Communication. Where the Wild Things Are, with its boy and its beasts, taught me that certain scary-looking monsters in the dark woods might not be so bad. They might even be fun. Maybe those teeth looked so big cuz they were smiling. The Beastie Boys launched a cultural revolution, not just because they were successful white rappers who helped bring the fledgling hip-hop music to the suburbs. They also showed that it was okay to throw any and every type of music and fashion into a blender and just be whoever and whatever you wanted, whether you were a musician or just a fan. You could like punk rock AND hip-hop, and they would juxtapose those and many other styles right next to each other on their albums as not-so-subtle reminders. The Beastie Boys were the wolf suit that Max would put on to cause trouble. When Max got sent to his room, and his walls turned into a forest, that was our record collection. Wandering in those woods was what we were doing in our rooms when we got lost in music, whether it was old Led Zeppelin albums or the B-Boys albums that sampled them. 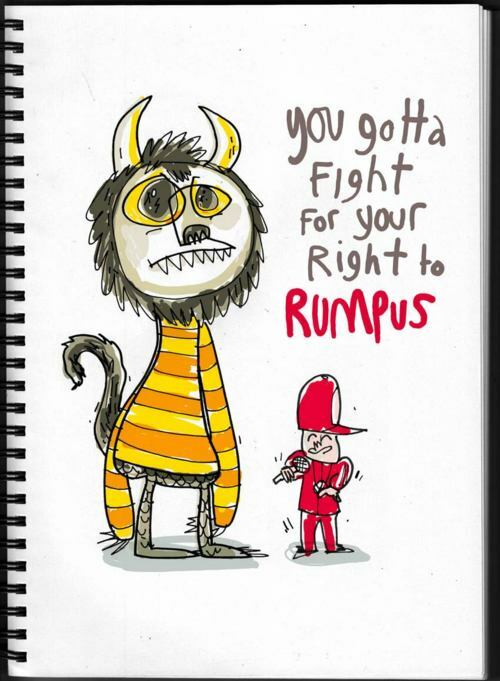 Where the Wild Things Are let the wild rumpus start, and the Beasties let the beat……. jaROP! As we tend to do when musicians die, I’ve been rocking some Beastie Boys in my listening rotation lately. And, like the last line of Where the Wild Things Are, it was still hot. Hey, why was Max’s dinner still hot when he got back to his room? Had he not been gone as long as he’d thought? Or had he never left? I titled this column in the present tense, Are, and not Were. Because somewhere tonight, tomorrow, and in and out of weeks and almost over a year… some kid is making mischief of one kind and another, and his room is turning into a forest. For many of us over the age of 35, the Beastie Boys were as big as the Beatles. With today’s passing of Adam Yauch, we have truly lost one of the greatest musical innovators of our time. The significance of the Beastie Boys in the history of music can never be overstated. From “Fight For Your Right” to Hot Sauce Committee Part Two, they never lost touch with who they were, where they came from, and what they were all about. Smoking a huge joint with my friend at the Jersey shore and walking onto the boardwalk to hear a yet-unreleased song from Paul’s Boutique playing over the speakers at a game stand. The song was “Shake Your Rump” and the middle buzzed-out bass line blew our teenage minds. This was not the same band that sang “did her with a whiffle-ball bat” anymore. Mature. Kinda. In college, basically rocking out to Check Your Head at every single party between the years of 1992-1995. Going to the local record store at midnight to purchase Ill Communication the minute it was released. Going home to put it on and being absolutely floored. Seeing them live at Lollapalooza when they put on one of the all-time greatest live shows I have ever witnessed. There was not one person among the 20,000 that didn’t dance, sing, and scream during every song. When the flute loop on “Sure Shot” opened the show I thought an avalanche of people were coming down on my head. Listening to Hot Sauce Committee Part Two for the first time and being so happy that they Boys still had something left in their tank. So yes, it is a very sad day for Beastie fans and for music itself. A great pioneer is gone. And like those before him he will be best served if we all home and blast “Jimmy James” until your neighbors call the police.